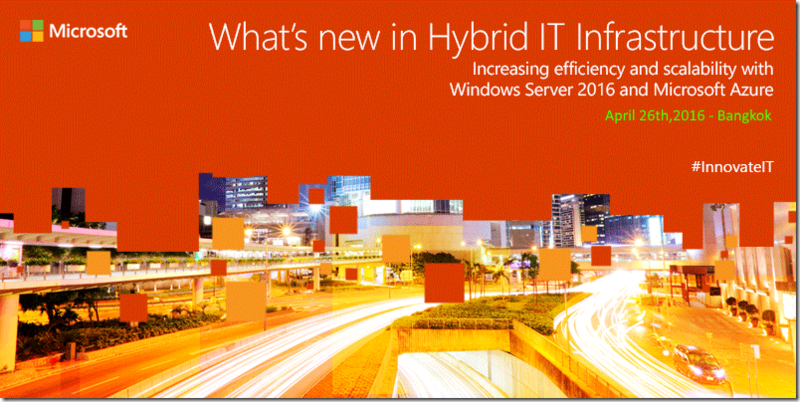 IT INNOVATION SERIES “What’s New in Hybrid IT Infrastructure: Increasing efficiency and scalability with Windows Server 2016 and Microsoft Azure” ( Microsoft IT Camps) in Bangkok , Tuesday 26-Apr-2016 from 9:00 am to 5:00 pm. This 26-April-2016 – IT INNOVATION SERIES ( IT Camps ) already fully booked . Microsoft IT Camp “What’s new in Windows 10 Enterprise: Increasing Security, Predictability, and Compatibility” in Bangkok , Friday 26-Feb-2016 from 9:00 am to 5:00 pm. 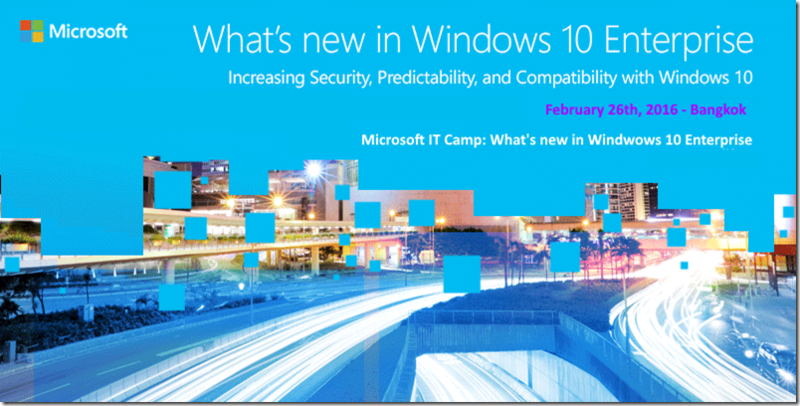 This 26-Feb-2016 – IT Camp already fully booked . ท่านจะได้ศึกษาและความเข้าใจเรื่องความสามารถใหม่ ๆ เรื่อง Security และ Identity ไม่ว่าจะเป็นเรื่อง Microsoft Azure Active Directory, Hello/Passport, Device Guard, Enterprise Data Protection รวมถึงเรื่อง Multi-Factor Authentication. ท่านจะได้ศึกษาและทำความเข้าใจเรื่อง Windows as a Service ทั้งสถานการณ์การใช้ Current Branch และ Long Branch . Microsoft IT Camp “Azure Infrastructure” in Bangkok , Friday 13-Nov-2015 from 9:00 am to 5:00 pm. This 13-Nov-2015 IT Camp already fully booked . Microsoft IT Camp “Extend your Datacenter with Microsoft Azure” in Bangkok , Thursday 21-May-2015 from 9:00 am to 5:00 pm. This 21-May-2015 IT Camp already fully booked . Microsoft IT Camp “Implementing a Mobile-First World with Microsoft Enterprise Device Infrastructure” in Bangkok , Thursday 26-March-2015 from 9:00 am to 5:00 pm. This 26-March-2015 IT Camp is already fully booked . Microsoft IT Camp “Extend your Datacenter with Microsoft Azure” in Bangkok , Thursday 19-March-2015 from 9:00 am to 5:00 pm. Microsoft IT Camp “Extend your Datacenter with Microsoft Azure” in Bangkok , Thursday 26-Feb-2015 from 9:00 am to 5:00 pm. This 26-Feb-2015 IT Camp is already fully booked . Microsoft IT Camp “Implementing a Mobile-First World with Microsoft Enterprise Device Infrastructure” in Bangkok , Friday 19-Dec-Nov-2014 from 9:00 am to 5:00 pm. 2. Sign into a Microsoft account* to continue. If you have an account password saved or you automatically sign into other Microsoft services that Microsoft account will be used to redeem the promo code. * Microsoft account is the combination of an email address and a password ( @hotmail.com, @outlook.com, @live.com ) that you use to sign in to services like Outlook.com, OneDrive, Windows Phone, or Xbox LIVE. Please don’t use organizational account with Office 365, Intune, CRM Online, or any of these supported services. 6. The subscription will take 2-4 minutes to activate. And you can find “available credit” from portal like this. *If you remove the monetary cap by providing a payment instrument, you will be converted to a “Pay-as-you-go” account at the end of the offer duration. **If the account has expired you will need to create a support ticket to enable conversion. 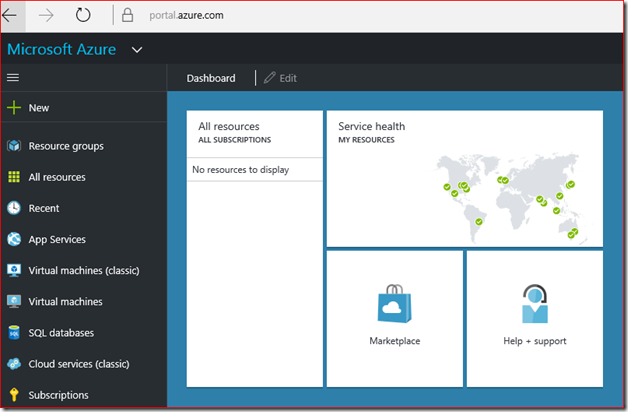 **Users who have used an Azure Trial can redeem a promo code. Users are able to redeem one trial and one promo code per account. 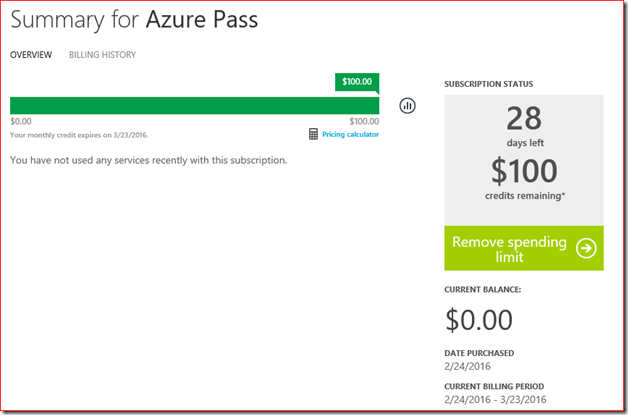 **If a user has already redeemed a promo code, he/she will need to create a new Microsoft account.